This is one of our own models we’ve designed to be an elegant and extremely robust electric bicycle. 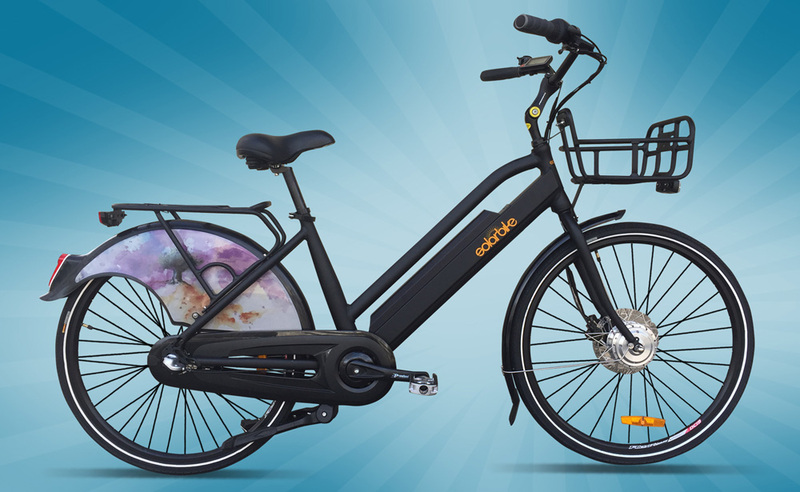 It has a great front hydraulic disc brake, top of the range PANASONIC 14.5Ah 36V lithium ion battery for an extremely long range and the proven SHIMANO Nexus 3 speed internal hub for ease of riding and longevity. Additional features include both front and rear carrier racks, front and rear lights, complete rear mudguard and chain guard. The decals on the mudguard have been drawn by friendly local artist Pablo Ruiz, click here to see some of his other great work. This is a pure and simple ebike that is extremely comfortable to ride and uses all top of the range parts. It will give you lots of riding pleasure and will match any ebike on the market for price and components. Please come in to take it for a test ride, we think you’ll be quite impressed!